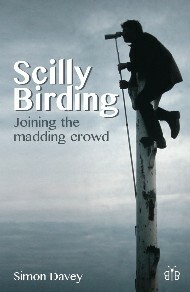 Scilly Birding is a humorous account of the passion, joys, highs and lows experienced by a dedicated bird enthusiast in his pursuit of an experience with rare birds on the Isles of Scilly. “What do you reckon they’ve got?” I asked. “There was an Icky (Icterine Warbler) here earlier”, said Chris with about as much enthusiasm and emotion as he might have said ‘starling’. “An Icky! Great!”, I enthused, scarcely able to control my excitement. An Icky was a full lifer tick as far as I was concerned, and this was after only half an hour’s birding. This was incredible! Oh to be on Scilly now September's here! I've only been to the Isles of Scilly once, as a child, on a day trip on the Scillonian from Penzance, and around Easter time. It must be time to go back! It's a pity they are so far away - but if they weren't out west, 25 miles out from Lands End, they wouldn't be the place to see stonking yellowthroats, crippling Swainsons and even stunning rustics. If the last sentence makes no sense to you, then Scilly, in autumn, may not be the place for you, because it is then that it is invaded by rare birds and odd birders. I would like to go there in September or October as much for the observation of the birding tribe as of rare wind-blown birds. Simon Davey's engaging book is one of those that tells you of the ups and downs of looking for birds - there are usually as many downs as ups. Cold and hunger can be endured as part of the experience but when you keep missing the birds by moments, or sometimes worse, see them but so briefly that you don't quite know what you saw (except everyone else tells you it was `the' rare bird) those moments can be hard to take. This is the tale of the ups and downs of two Scilly weeks in October 1984. To some readers it will open up a strange new world of looking for rare birds and to others it will recall similar days of joy and/or (usually `and') frustration. It's a good read and will appeal to more than the committed birder. The observations of birders are completely authentic. What a Scilly crowd we can be!